Global Green and Healthy Hospitals’ Hippocrates Data Center is the first international platform of its kind designed for the health sector to measure actions towards reducing its environmental footprint. A new, cutting edge resource that puts the power of data management, goal bench marking, and progress tracking into the hands of each GGHH member. Housed on GGHH Connect, Hippocrates allows members to track, store, and visualize their data on a secure web-based platform. Hippocrates allows members to track waste production in relation to new recycling programs, analyze the impact of their energy efficiency efforts, understand greenhouse gas emissions from their facilities, and report on progress to facility leadership. It is a one stop shop for health care sustainability data! Data collection tools are currently available for waste, energy, and climate with more to be released in the coming months and years. Data forms for the GGHH sustainability goals provide members with the ability to submit data from their institution, analyze the impacts and success of projects, and identify opportunities for the future. 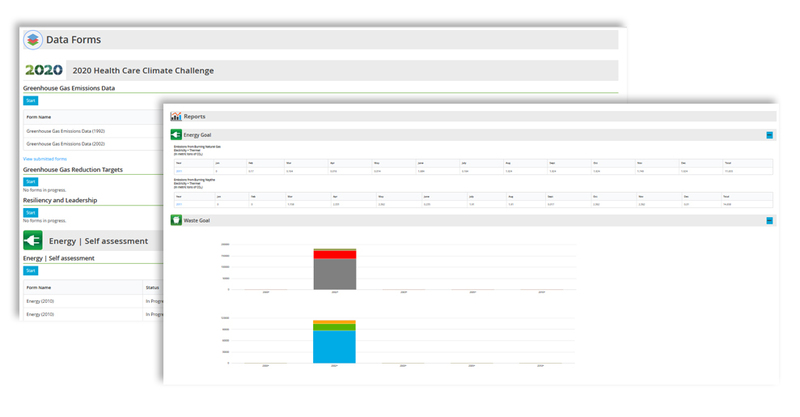 Dashboards with graphs and charts to visualize impacts, performance, and progress achieved over time. Data archives to store, export and download all data submissions and reports. Team management for multiple staff members from the same institution to access and collaborate on data submission and analysis. Multilingual access in English, Spanish, and Portuguese. Hippocrates also syncs with Google Translate for viewing and use in other languages. Hippocrates is not just about data! Log into your GGHH Connect account (gghhconnect.net). Not a GGHH member? Click here to become a member today!